Swoon… …I’ve always admired Henri Matisse and his gorgeous bold vibrant artwork. So who better than he to inspire my new class which is all about colour and pattern! This class combines so many of my favourite things – well the collage for a start 🙂 …plus girls – sketchy and cute, flowers – lots of them, patterns of every shape and style and of course the gorgeous colours, so vibrant and full of life and happy joy! But we don’t leave our collage bare, we paint over it to give it extra shine and vibrancy, and really punch those colours out. ahh the joy of it all. Class is now open for immediate tearing, gluing and painting! To celebrate I am giving away a free spot in this class! whoop! I will draw the winner by random number generator in 3 days time. *** if you purchase the class and win the giveaway I will refund you! What a fantastic idea for a class! It will be awesome! Great class! I love the colors and patterns! Shared on Facebook. Looking forward to attend on of your classes. Your style appeals to me! Love your work but your girls (all of them!) have a special place in my heart! I love the fauvists! Would love to paint with you. Another great class for me to take! Yay!!!! Will share on FB, too! 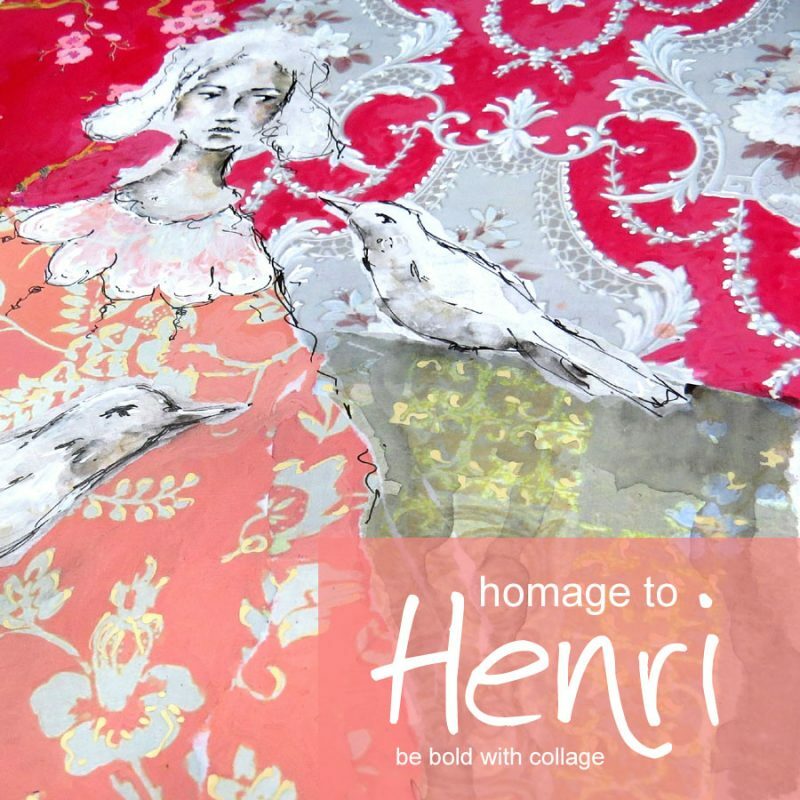 This is awesome!…love your work and love Henri!…a perfect combination!! Shared…thanks for the chance to win! Love your work Toni, your “Goose Girl” was one of my favorites on Ever After this year. Posting on Facebook. AWESOME! THANK YOU SO MUCH FOR THE GIVEAWAY OPPORTUNITY! Love, love, love the gorgeous faces in your work! I’d love to take this class. Whoot whoot, I would love to win this class. Love your work and this looks amazing. Thanks for the opportunity. Love you art!! Would be wonderful to win!! Have so enjoyed the classes I’ve taken so far…am sharing this one on my FB page! sounds great Toni! Sharing in on Facebook yay! Oh how I would love to play! How long will the class be up? I’m so smashed for time… Love this! This looks like a really great class – further adding to my dilemma as to which to choose first! Wow, your video had me at use bold colors. Shared on FB & would love to put my bold colored hat in the ring. I love the look of this class! How long will the class stay up? I’m so smashed for time right now but, oh how I’d love to play here! Sorry for the duplicate entry, thought the first response didn’t go through. This class looks like so much fun! And I love your new necklaces too!!!! It looks like a class that I would like to take. Thanks! Hi Toni, it looks like a class that I want to take. Thank you! Another great class it looks like. Love your colors and of course the girls! Coloricious! This would b an awesome gift! Something I could never do on my own. Henri Matisse is one of my favorite artists. I love all of his bold colors and patterns. This will be an exceptional class. Thank you for the opportunity to win a spot. I’m swooning already. Your concept and your work is innovative and fresh. This will be a great class. I do so admire your work. Shared, this looks so wonderful! Oh WOW, this class looks like it’s going to be such fun. Keeping my fingers crossed for a place. Wow, such vibrancy 💕. Thank you for the opportunity to win place on this. Love the pastel colors, collage work, flowers & romantic flair with this piece…I would love to learn more about creating fun pieces of art so winning a spot would be a great opportunity to do so. Shared on fb. This class looks so interesting, i love collage and i love your art, i hope i win this class! Ohhh…how I would love to do this class! Looks like a lovely way to learn more about approaching patterns and combining them with mixed media! I sooooo want to take your classes!!!!!! Winning a spot would be a total blessing!!!!! So enjoy your classes. Would love to win a spot in this one! I would love to win a spot in one of your classes. Love your work! Love all the color and patterns. Thanks for the opportunity to win a spot…. your classes are so amazing! I just love your art so much and you are a wonderful teacher! Oh what an awesome opportunity, to win this class. I love playing with colour but mostly pastels, BUT these bright colours are so beautiful. I am keeping my fingers crossed. Class looks fabulous! Thank you! Your work is so inspiring. Thank you for the opportunity to win. Would love to learn more from you!! Love, love, love this class! Love the colours, the flowers, the birds and I love your teaching style! This looks fabulous Toni!! Always been a fan, perhaps it is time to delve into one of your classes! Yippy! Another great class. Can’t wait to try it! 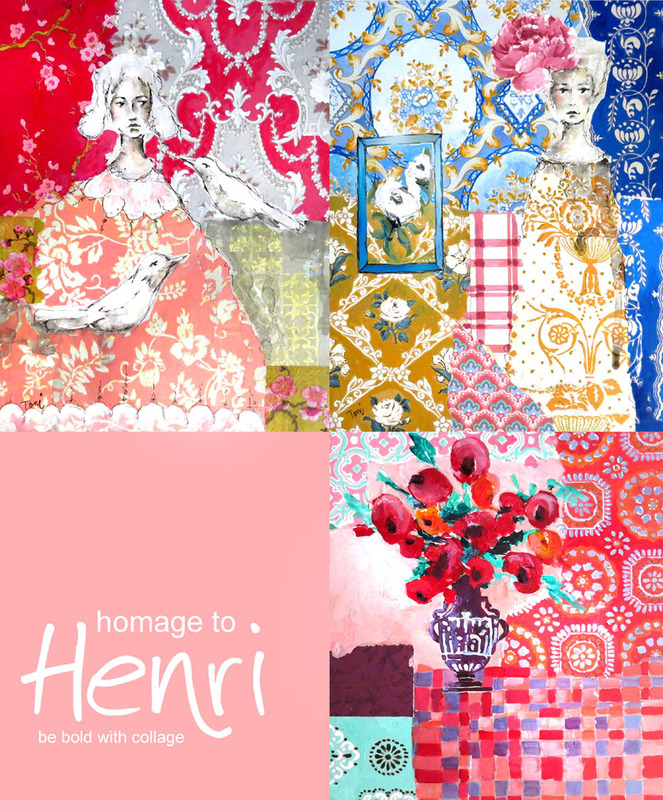 love Henri and your art… shared, thank you! Another beautiful class Toni! Yes I would be delighted to win a spot! I love Matisse! Shared on Facebook. I would love to win your class. I like be your work. Already shared your FB post, but can do it again! This class looks amazing!! WOW!!! Shared! I’m in love with your faces!!! I’ve loved the other classes I have taken! Working on loose!!!! This class looks so interesting. Thanks for the chance.